I love to talk about books, writing, and history with young readers. 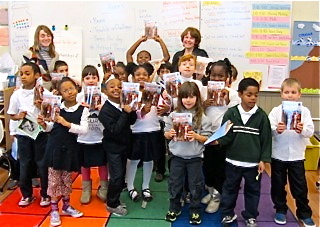 Here I am with second grade students in Washington, D.C. My visit was sponsored by the wonderful organization An Open Book Foundation. They made sure that every student received a copy of one of my books. In this case it was one of my favorites—Prisoner for Liberty! Some Missouri kindergartners meet Emily and Carlo. Talking about President Lincoln, Willie Kettles, and the Telegraph Machine during Presidential Family Day at the National Portrait Gallery. Discussing the writing process and my books Emily and Carlo and Prisoner for Liberty during my visit to a Silver Spring, Maryland elementary school. 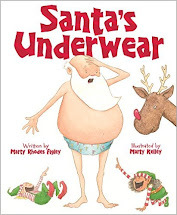 Enjoying a visit to a lively Virginia kindergarten class with a fun reading of Santa's Underwear! 3-5th Graders listening to the strange but true story of Jim the Wonder Dog. My 3rd through 5th grade students were captivated by the unique and intriguing story of "Jim the Wonder Dog." Being the talented storyteller that she is, Marty shared her story of how she first learned of Jim and the extensive research she did to write this fascinating true tale. The students loved seeing real pictures of Jim and his owner, Mr. Sam, and enjoyed hearing about the manner in which he was able to find anything, read, and predict the future in a hotel in Marshall, Missouri. Not only did she share this remarkable story with the students, but she also integrated how she used primary and secondary sources, the importance of oral history and the impact it had on this book, and tips in good researching. This presentation was so engaging that when it ended and Marty asked if there were questions from the audience, just about every one of my students' hands were in the air wanting to know more about Jim and Marty as an author. 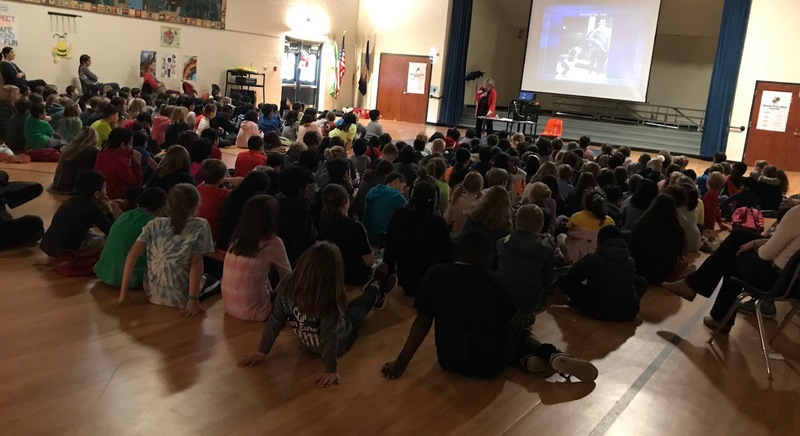 This presentation was one of my favorite author visits to date! Sarah E. M. Slaughter, Ed.D. "From Horses to Dogs to Emily Dickinson: How an Idea Became a Book"
Most people envision one of our country's finest poets, Emily Dickinson, tucked away in her bedroom, dressed in a spotless white dress while she writes gorgeous, lyrical poetry about life, death, nature, and immortality. There was another side to Emily. For sixteen years she owned a huge, slobbery, shedding Newfoundland dog. 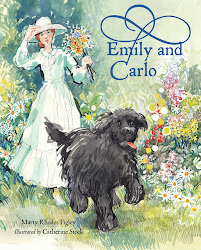 My picture book Emily and Carlo tells their story. My talk traces how an idea becomes a book, while sharing the story of Emily Dickinson and her beloved dog, Carlo. Revolutionary War hero James Forten's story told traditionally and as a graphic novel. Will show the differences and similarities in Prisoner for Liberty and The Prison-Ship Adventure of James Forten, Revolutionary War Captive. We will examine the question "What is a hero?" as we learn about the courageous actions of the main characters in three of my books The Schoolchildren's Blizzard, Saving the Liberty Bell, and Prisoner for Liberty. Emily and Carlo; Who Was William Penn? ; The Prairie Adventure of Sarah and Annie, Blizzard Survivors; Clara Morgan and the Oregon Trail Journey; The Prison-Ship Adventure of James Forten, Revolutionary War Captive; John Greenwood’s Journey to Bunker Hill; President Lincoln, Willie Kettles, and the Telegraph Machine; Prisoner for Liberty; Washington Is Burning; Saving the Liberty Bell; The Schoolchildren’s Blizzard. I know how to use humor to enliven a talk and to captivate a young audience. I tell the children how I became a writer, and urge them to discover their writer within. We talk about history and historical fiction and their similarities/differences. I discuss my research techniques and the wonder of primary sources. I share why I chose to write the books I did and give the children tips on where to find their own ideas. I show my very messy brainstorming pages, rough drafts, edited pages, and proofs to help explain how a book is created. A question and answer session will follow my talk. The purpose of my presentation is to inspire young people to write. I'd be happy to tailor my presentation to your specific needs. Judge for Literature, National PTA Reflections Program/Washington, D.C.
Presidential Family Fun Day, National Portrait Gallery/Washington, D.C.